Hello and welcome back! For those that don't know me irl or check back here frequently (I leave updates in the announcement bar from time to time) my dad had cancer surgery kind of last minute on the 12th so I ended up neglecting the blog quite a bit in order to visit him at the hospital and spend time with him. I had pre-shot a lot of content thinking I would want to work while he was in the hospital however that just didn't happen but now that's he's home and getting around really well I can get back to business. Today I decided to do kind of continuation on my last post, 2017 Beauty Recap: Hits, Misses & Meh, which went over most of my beauty purchase from 2017 and I thought I would narrow it down to my 10 favorite products I tried last year. Most of these were not new releases in 2017 but were new to me since I pretty much overhauled my entire makeup collection and skincare routine. I try a lot of new products and not all of them make it onto the blog so I hope you enjoy and let's get started! I don't know about you but Glossier was a brand I heard a lot about in 2017 so it just wouldn't be right not to include them here and this is my favorite Glossier product that I've tried thus far. I would really only recommend the rich version of the moisturizer for those with combo dry to very dry skin but for those with normal, combo oily or oily skin types check out the regular Priming Moisturizer. I just purchased my second jar of this because I missed it so much and it might be on its way to holy grail status for me. It's just such a good base for applying makeup over and I cannot recommend it enough. If you want to try out this moisturizer, or any other bits from Glossier, click here and you can get 10% off your first order (the only thing I would avoid is the body products since they have very hit or miss reviews). I can't believe I'm saying this but take away all my other eyeshadow palette and leave me my Star Palette and I would be okay with that (though I'd be sad about a few others). Yes, the price tag is next level crazy but when you look at how many grams of product you're getting compared to some other palettes on the market (Anastasia Beverly Hills for example) you're actually getting a better price per gram value. If you can't swing the cost for one of the larger palettes try a Eyeshadow Palette 5, $48, to get started to see if the formula works for how you like to apply eyeshadow. If you are ready to make the commitment I would highly suggest you start saving up your coins now and wait until April or November for Sephora's site wide sale so you can get 10% or more off depending on what level you're at in their rewards program (I bought mine in November during the sale and saved almost $34). If you read my skincare post and are thinking this looks different then you would be correct. Shortly after that post went live I realized I actually hated the First Aid Beauty Ultra Repair Lip Therapy, just wasn't nourishing enough for me, so I bought this so I'd have a thicker balm for overnight. As much as I like the Restorative Lip Balm the Moisturizing Stick is just as good and is five dollars cheaper so I would recommend that one over this just for the sake of being cost effective (I just didn't have one to photograph). Both Bioderma Atoderm Balms are great and actually repair, nourish and sooth chapped lips instead of just putting a greasy layer of slime over the lips that give them a false sense of hydration like a lot of balms do. I would recommend either/or and just get the one that has the application or texture that you prefer. I'm kind of cheating here and grouping these together since I use them jointly but I love them both and since I do use them together I can't pick just one. Both oils are great for dry skin but the argan oil helps with flaking (and can also be used on hair) and marula oil helps fight free radical damage, helps restore a radiant tone and can help with elasticity. Marula oil is more of a workhorse but the argan oil does a lot for dry, flaky skin. Other oils from The Ordinary that would be good for dry skin are the 100% Organic Cold-Pressed Rose Hip Seed Oil (moisturizes and fades signs of sun damage) and the 100% Plant-Derived Squalane (hydrates and promotes a soft, supple texture) both of which I will be purchasing at some point. You can mix multiple oils from The Ordinary together since they are 100% the ingredient but just don't go mixing too many or you might overdo it. I love The Ordinary and would definitely recommend these products for those with combo dry to very dry skin. A makeup sponge may not be the most exciting but as someone who likes to use a sponge to apply foundation this has been an amazing tool. The Fenty sponge is a lot softer and more bouncy than the beautyblender and it's four dollars cheaper so it is now my go-to makeup sponge. The only slight drawback is that it doesn't have the point to get up under the eyes for blending concealer but the flat edge makes cleaning up eyeshadow mistakes 10x easier so there is a plus with the shape. To compensate for the lack of a point on this sponge I do still use my beautyblender micro.mini to blend concealer and thought I would mention those since they are currently on the Weekly Wow at Sephora at $10 for two minis (reg. $18). Love the Fenty sponge the most though and I think I'm definitely overdue for a new one. Of course these had to make the cut because the Facial Radiance pads were a game changer for me towards the end of 2017. I liked how soft the physical exfoliant I was using made my skin but it wasn't really helping with any of the texture issues I was having on my forehead so I decided to give these another go (I had received a travel size 10 count from an Allure Beauty Box in March). I started off using them twice a day to get the cell turnover and exfoliation going, they contain lactic and glycolic acids to exfoliate and tone, but now that I'm on my third container I just use them once in the evening for maintenance and that has been working out perfectly for me. I have somewhat sensitive skin and have had zero irritation since using the product and I love that it's alcohol and fragrance free. Pixi Glow Tonic To-Go is similar but contains fragrance and doesn't have lactic acid though it is $12 cheaper so you could try that out first if your skin is not sensitive to fragrance and see how you get on with it. If you want to try the Facial Radiance Pads and don't currently use an acid or exfoliate regularly I would highly suggest starting with only using it twice a week or every other day and then building up to using it once or twice a day so your skin doesn't freak out. Great product though that I will continue repurchasing and would highly recommend. I hate showing you a product that was limitted edition but this is such a good bronzer that I couldn't not include it. This shade is perfect for fair skin because it's not too orange but still gives some warmth and structure to the face. I heard how great the bronzer was from the first Victoria Beckham x Estée Lauder collection so when the second one dropped I immediately swooped in and bought it. I'm not certain but I'm thinking there will be another collection from Victoria Beckham this fall since the second collection dropped about a year after the first and the first two were such a success so I don't see why they wouldn't continue on with the collaboration. If there is a third collection and it contains a bronzer I would say check it out because the first two were so good. Again, not another super exciting product but when you have dry skin like me and find a powder that doesn't make you look even more dry it's worth celebrating. This powder is so finely milled that it's almost invisible on the skin and doesn't give a dry, matte look but just softens any shinny areas and gently sets the makeup without looking too harsh. It's pretty darn expensive and only comes in three shades, though to be fair the color coverage is negligible, but it's a great powder for normal to dry or mature skin types. 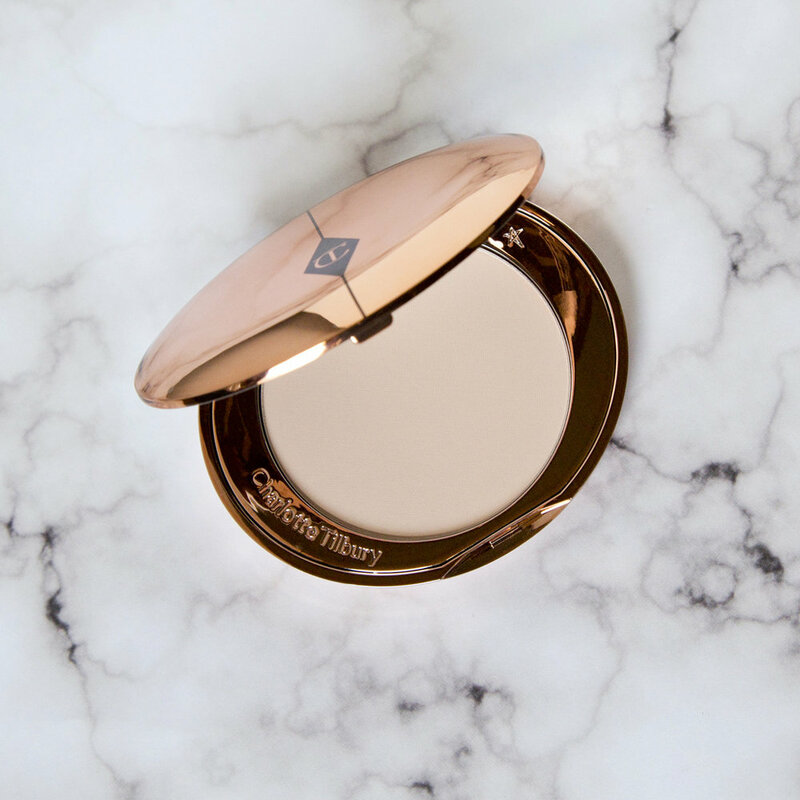 If you want to check this out, or any other Charlotte Tilbury products because they're seriously amazing, you can click this link and get $15 off your purchase of $75 or more (only works for new customers though). I seriously upped my highlight game in 2017 but this one was probably the most used. As you can see the shade I own has a light pink cast and looks particularly amazing on fair and/or cool undertone skin tones but there are four different shades total if a pink highlight isn't your thing. This highlighter gives such a glow and shine but isn't glittery which is what I look for (Pink Glow is a lot like Pink Heart from the Anastasia Beverly Hills Moonchild Glow Kit but not glittery like the Glow Kit is). It's also very buildable so you can go for something more subtle if you don't want to blind everyone at the office of you can layer it up to make the skin look extra glossy. Pro tip: use a setting spray to help the powder melt into the skin and look even more amazing (recommend this with any powder highlight though). It's super pricey for what it is but if it's in your budget and you like shinny but not glittery highlighters then it would be a good one to look into. I love this foundation so much but the shade range leaves something to be desired with only 12 shades. Without seeing any swatches and from what I can tell online there is only one what I would consider to be a medium-deep shade and the rest are all for fair to light-medium skin tones. Hourglass needs to get their act together because this is a beautiful medium to full coverage foundation for dry skin that everyone should be able to try. If you're not dry to very dry I wouldn't necessarily recommend this because it is a very hydrating and radiant foundation. I hate recommending a base product that doesn't have a very good shade range but this was my favorite foundation that I tried in 2017 so I decide to included it. Of the foundations at Sephora that are recommended for dry skin and that have a radiant finish the Giorgio Armani Luminous Silk Foundation has the best shade range at 41 shades so that would be worth checking out for a more inclusive shade range if you have dry skin and like a radiant finish (it's on my wishlist so I might be picking up a mini size come April if my shade is in stock). Phew, we made it! That was a lot of info but if you have any other questions on a particular item please do not hesitate to ask because I love talking about makeup and beauty products. If you made it back here after my three week hiatus thank you so much for sticking with me and hopefully I'll be back to posting more regularly from here on out. That is it for today and I will see you all next time! Note: This post contains affiliate links. Affiliate links mean that if you use a link I've provided to purchase something I will receive a small commission but it does not effect your purchase price. Using affiliate links helps support bloggers by providing income to maintain the blog and create new content!